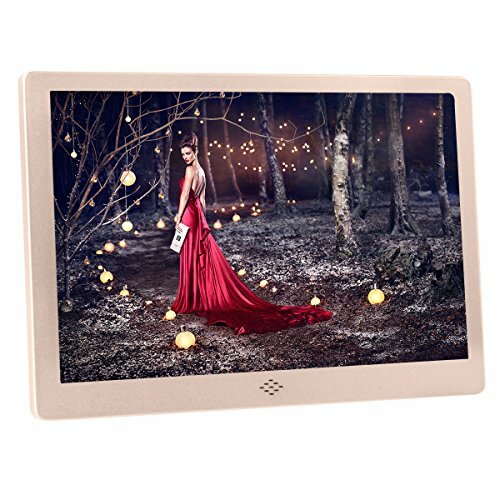 This digital frame makes photo sharing or advertising easier and to bring generations together through easy technology (wifi connectivity, USB drivers and menmory cards). You can rotate the photo by using the remote control or pressing the buttons on it. Can be used as business gifts, holiday gifts, birthday gifts, souvenirs and other gifts, and can also be used in other aspects such as home decoration, exhibition display, wedding photography, advertising promotion, etc. Item Dimensions: 7.9" x 11.7" x 0.95"
Built-in Ports: SD, USB2.0, MMC, etc. SUPPORTS FORMAT : JPEG, JPG, BMP, PNG, GIF. Most of the photos and all videos can be displayed on the frame. CONVENIENT: Connect a USB flash drive, cables, WIFI connectivity or memory cards to easily access and share your favorite photos or show your advertisements. MULTIFUCTION: Clock, calendar function, stereo speakers, displayer,computer or TVs.Timed boot and shutdown. PERFECT GIFT: Great for your families, friends, coworkers and customers. If you have any questions about this product by Any-door, contact us by completing and submitting the form below. If you are looking for a specif part number, please include it with your message.